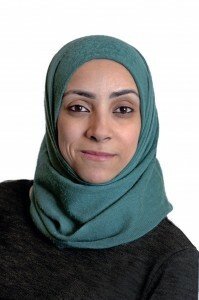 Farida is a trainee solicitor with the Women & Young Persons’ Department at Legal Services Agency. She holds an LLB with First Class Honours and a Diploma in Legal Practice from the University of Strathclyde. She is a part-time tutor in Human Rights Law. During her studies, Farida volunteered as an adviser with the University of Strathclyde Law Clinic. Since leaving university, she has gained varied experience of volunteering and working in law centres and charities in the refugee sector. She first became involved with the Women & Young Persons’ Department as a volunteer in November 2011 and she later took up temporary administrative and casework posts with the Department. From June 2013 until December 2015, Farida worked as a casework coordinator with British Red Cross Refugee Services. She managed a team of volunteers to provide an advice and support service for vulnerable refugees within the Holistic Integration Service (a partnership project led by Scottish Refugee Council). In June 2015, she was seconded to a new role working with asylum seekers and focusing on preventing or alleviating destitution, including assisting clients with preparation of asylum support applications and appeals. Farida is excited to be working with the Women & Young Persons’ Department again as a Justice First Fellow. A research-based project exploring legal issues around access to safety for migrant women affected by violence, particularly women with no recourse to public funds. Key partners in the field of women’s rights tell us that one of the largest emerging problems in supporting women affected by violence is providing immediate safety and protection to migrant women who have no recourse to public funds. It is not always clear what steps must be taken by the authorities to ensure compliance with human rights obligations and national and international legal standards in this area. Over the course of the project, Farida will work on developing resources which aim to increase understanding of rights and remedies for migrant women affected by violence, including guidance for frontline workers and a legal toolkit for practitioners working in this area. She will also assist with the Department’s casework (including strategic litigation should a suitable test case be identified) and training activities.